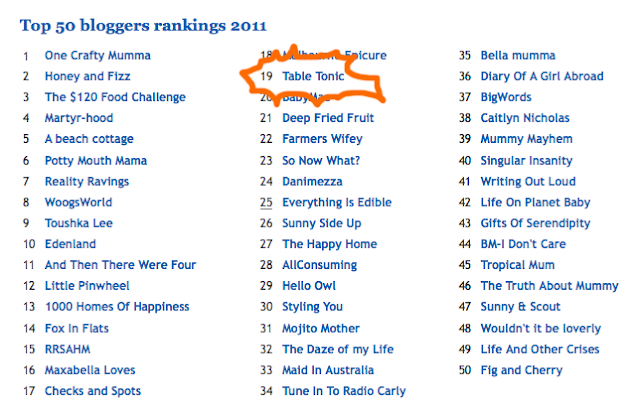 Table Tonic makes Kidspot's Top 50 Bloggers! Wowee! 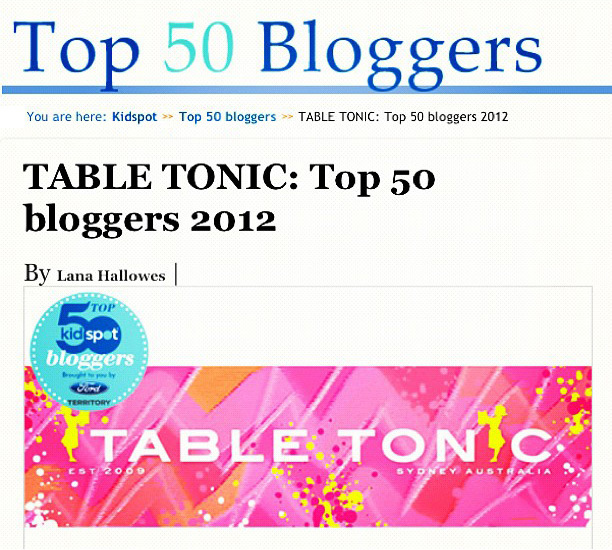 Table Tonic has been included in Kidspot 's annual Top 50 Bloggers list for 2012! Thank you Kidspot for the honour! But here's the best bit - YOU can win $5000 just by voting. Yes, you read it right! Kidspot are giving away $5000 to one lucky reader who has voted for their favourite blog in the Top 50 bloggers competition. And it couldn't be easier. To be in it to win it, click here for more info. And vote #1 TT! You might remember I blogged about being included in Kidspot Top 50 Bloggers 2011, and here's how that panned out - Table Tonic was in the top 20 (okay, only just)! So thank you, thank you, thank you! But seriously - all of the blogs on the 2012 list are worth a visit, a read and a bookmark, so click here and scroll down to the bit with links to ALL of them. Enjoy! PS Don't forget to Vote #1 TT - it only take a second. Thanks you guys!